Want to be notified of new releases in buds-lab/the-building-data-genome-project? Does your data science technique actually scale across hundreds of buildings? Is it actually faster or more accurate? These are questions that researchers should ask when developing data-driven methods. Building performance prediction, classi cation, and clustering algorithms are becoming an essential part of analysis for anomaly detection, control optimization, and demand response. But how do we actually compare, each individual technique against previously created methods? They created the time-series data benchmarking set. This data set enables testing of new techniques on an assortment of real world data sets. For commerical buildings data, we are doing the same! Most of the existing building performance data science studies rely on each individual researcher creating their own methods, finding a case study data set and determining efficacy on their own. Not surprisingly, most of those researcher find positive, yet questionably meaningful results. Using a large, consistent benchmark data set from hundreds (or thousands) of buildings, a researcher can determine how well their methods actually perform across a heterogeneous data set. If multiple researcher use the same data set, then there can be meaningful comparisons of accuracy, speed and ease-of-use. It is an open data set from 507 non-residential buildings that includes hourly whole building electrical meter data for one year. Each of the buildings has meta data such as or area, weather, and primary use type. This data set can be used to benchmark various statistical learning algorithms and other data science techniques. It can also be used simply as a teaching or learning tool to practice dealing with measured performance data from large numbers of non-residential buildings. 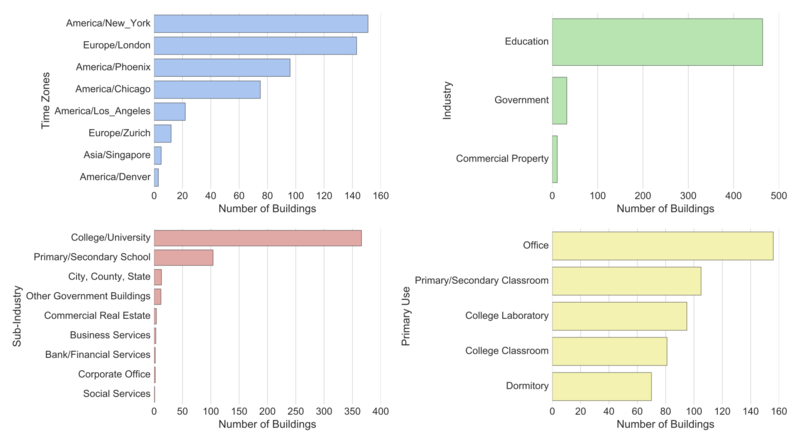 The charts below illustrate the breakdown of the buildings according to location, building industry, sub-industry, and primary use type. Clayton Miller, Forrest Meggers, The Building Data Genome Project: An open, public data set from non-residential building electrical meters, Energy Procedia, Volume 122, September 2017, Pages 439-444, ISSN 1876-6102, https://doi.org/10.1016/j.egypro.2017.07.400. abstract = "Abstract As of 2015, there are over 60 million smart meters installed in the United States; these meters are at the forefront of big data analytics in the building industry. However, only a few public data sources of hourly non-residential meter data exist for the purpose of testing algorithms. This paper describes the collection, cleaning, and compilation of several such data sets found publicly on-line, in addition to several collected by the authors. There are 507 whole building electrical meters in this collection, and a majority are from buildings on university campuses. This group serves as a primary repository of open, non-residential data sources that can be built upon by other researchers. An overview of the data sources, subset selection criteria, and details of access to the repository are included. Future uses include the application of new, proposed prediction and classification models to compare performance to previously generated techniques. " We recommend you download the Anaconda Python Distribution and use Jupyter to get an understanding of the data. Please update this list if you add notebooks or R-Markdown files to the notebook folder.